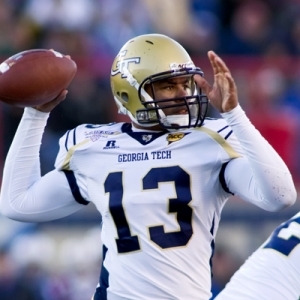 A mid-season three-game slide derailed a promising 2010 season for Georgia Tech, leading to a 6-6 regular season record overall and a 4-4 record in ACC play. Part of the unexpected downturn was an injury to quarterback Joshua Nesbitt that ground the Yellow Jackets’ high-powered offense to a halt. They finished the year ranked first in the nation in rushing yards per game, but 71st in scoring with just 26 points a game. The season ended on a sour note with a 14-7 loss to Air Force in the Independence Bowl. This will be Paul Johnson’s fourth season at the helm in a tenure that has included three straight bowl appearances and one ACC title. He met some widespread skepticism for installing a rare triple-option attack on offense, but has been able to prove his doubters wrong when equipped with the proper personnel in the skill positions. Last season’s 6-7 record did not sit well with Yellow Jacket fans after a highly successful 2009 campaign that saw the program post an 11-2 record, including a 39-34 win over Clemson in the conference title game. The result has been a return to scrutiny of Johnson’s offensive system. It will come down to a two-man competition at quarterback in an effort to replace the departed Nesbitt. Tevin Washington should have the inside track after filling in when Nesbitt went down last season, but look for redshirt freshman Synjyn Days to make a strong push for the starting spot once summer camp begins. Fortunately, this offense is still loaded with talent at the running back position with the return of Roddy Jones, Orwin Smith, and Richard Watson. It also returns three starters on the offensive line, including guard Omoregie Uzzi, who was an All-Conference selection last season. Defensive Coordinator Al Groh will only have five starters back from last year’s squad and will be faced with replacing the entire secondary. The defensive line will have the most experience with the return of DE’s Jason Peters and Izaan Cross and DT Logan Walls. The linebacking corps will be led by Julian Burnett on the inside and Steven Sylvester on the outside of Groh’s 3-4 scheme. Burnett led the team in tackles in 2010 with 89. The Yellow Jackets open the 2011 season with a home game against Western Carolina followed by a road game against Middle Tennessee. Things get a bit more difficult from there with a home game against Kansas and back-to-back games against North Carolina and NC State. The real meat of the schedule includes a Oct. 22 showdown with the Hurricanes in Miami and then home games against Clemson and Virginia Tech over the next two and a half weeks. The one break is that Georgia Tech will not have to face Florida State unless the two would meet in the conference title game. Georgia Tech has been opened by Bodog as a 150/1 longshot to win this year’s BCS titles with five other teams in the ACC having better odds to win it all. Other books have opened the Yellow Jackets at +2500 to win the ACC title in 2011, which is the same as the Wolfpack and only better than Virginia (+5000), Duke (+10000) and Wake Forest (+10000) in the conference. Johnson will have his hands full this season trying to squeeze out enough wins to get team his team back to a bowl game for the fourth straight season. The inexperience at the quarterback position in a complicated offensive system along with an untested defensive secondary could lead to a another losing year, which would undoubtedly bring some unrest among the Yellow Jacket faithful. Look for Georgia Tech to top out at a 5-7 record overall and a fourth-place finish in the ACC Coastal Division.